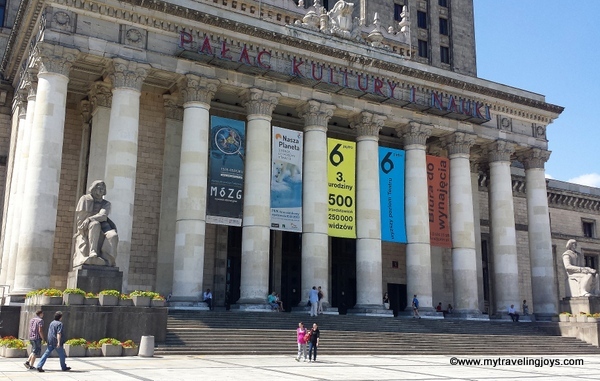 This week, one of Warsaw’s most iconic buildings, the Palace of Culture and Science (Pałac Kultury i Nauki), turns 60 years old on Wednesday, July 22nd. It’s a building, the tallest one in Poland at 231 meters, that people either love or hate. As we called Warsaw home for 27 months, I saw the Palace of Culture every day from our balcony, except on really foggy days. I happen to rather like this skyscraper that lit up the city’s business center in different colors every night, which reminded me of the Empire State Building in my beloved NYC. It’s a building I photographed many, many times while we lived in Warsaw as you can see from the photographs in this blog post. 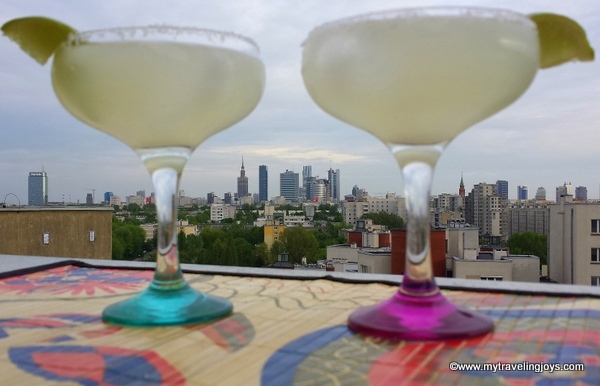 Balcony margaritas to celebrate Cinco de Mayo in Warsaw. Where is the Palace of Culture? However, the building, originally named in honor of Joseph Stalin, was considered a “gift” from the Soviet Union to Poland after the Communists took over following World War II. For obvious reasons, many Poles dislike what the building represents and the fact it was built in the middle of the city where people lived in burnt-out tenement buildings following WWII. 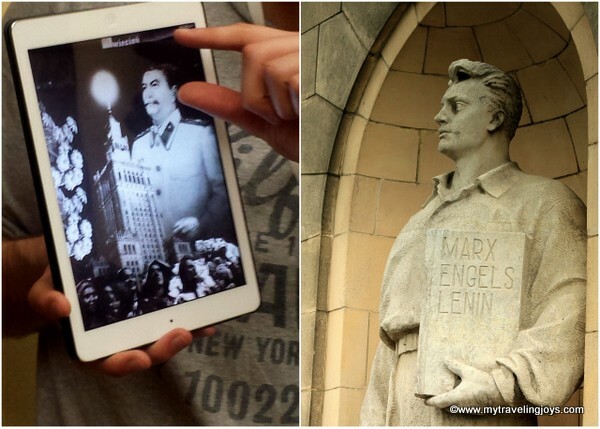 Stalin's name was erased from the statue on the right after the Communist regime fell in 1989 in Warsaw. Little do most Poles know that the building’s design was partially based on some Polish architecture. A misty view of the "Palace of Culture" in Riga during our November 2014 Baltic Road Trip. To celebrate the Place of Culture’s 60th birthday this week, there will be special events on Wednesday from 12-17:00, concluding with a birthday cake cutting ceremony at 5 p.m. If you want to participate in the fun on the eve of the 22nd, people are encouraged to buy entry tickets to the observation deck of the Palace of Culture from the lobby entrance along ul. Marszalkowska. More details can be found here. In addition to the special events on Wednesday, there is an anniversary exhibit which includes architectural models, furniture, audio devices, uniforms, key rings and vintage paraphernalia once used in the building. This exhibit runs through July 31st. Thirdly, there is a special photo exhibit by local Polish photographer Jacek Fota running from July 22 until August 26, which features the interior and people that work in the Palace of Culture. 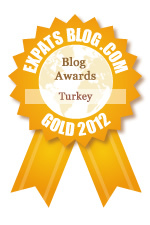 is the home of several public institutions, a movie theater, sports club and local museums. takes 40 million zl to maintain every year. the Polish government paid about 160 million zl for its construction during the 1950s. Did you also know that the Rolling Stones and Elton John have played at the Sala Kongresowa here? Though the Palace of Culture may be either loved or despised, the building represents a part of Warsaw’s past. This week is the time to remember the city’s history and pay tribute to its future. Happy Birthday to the Palace of Culture in Warsaw! By the way, the interior of the palace is just as impressive as the exterior! 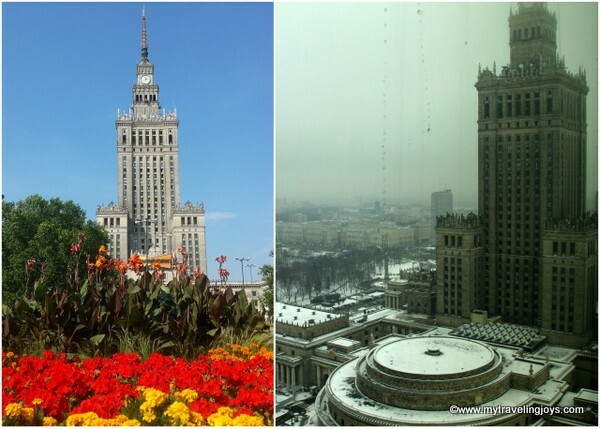 Spring and Winter views of the Palace of Culture in Warsaw. Northern view during winter from the observation deck at the Palace of Culture in Warsaw. Southern view from the observation deck at the Palace of Culture in Warsaw. View of Old Town from the observation deck at the Palace of Culture in Warsaw.